The recent birth of my third child (a girl, all good, thanks for asking) meant another stab at picking a “good” name. By good, I mean a name that ticks a few of these random boxes: not too popular; not too weird; sounds nice; no major associations; works with the other names we picked; doesn’t create a stupid acronym. That sort of thing. And being something of a data nerd, I of course turned to the top list of baby names provided by the ONS. I’ve mentioned before the curiosity of names, and the readable analysis in freakenomics is fascinating. However, a few things in the top girl names [xls file] (2009, the most recent list) struck me. A quick test: our children are called Matilda, Francesca, and Annie. In 2009, the most recent data, which was the most popular? I would have thought Annie, but it was actually not even in the top 150, coming in at 153. Francesca was 98, Matilda at 46. Weirdly, the names Lexi (47) and Lexie (69) – which count as separate names – when added together get into the top 30 with over 2,000 registrations. But the most notable thing about Lexi(e) is that it has risen from nowhere – in 1999 both variations barely got into the top 2,000 names. But buried lower in the data was the confirmation that naming children can be terribly contrived. For nine months of the year, the most popular names are as you might expect. But then in June and July, Summer appears in the top 10. Overall in 2009, it ranked 24th with 2,054 girls given that name. But June and July saw 608 of those, nearly 30 per cent of the total. I’d guess it’s close to the top 10 for August too. In December, it’s even worse. Holly, a name that over the year ranks 19th, is top in Christmas month, with nearly 23 per cent of its registrations, (519 of 2,263). It doesn’t get in the top 10 for any other month. Basically, if you meet someone called Holly, you have a 1 in 4 or so chance she was born in December. Without wanting to sound too clever, I think we’ve picked good names. It’s a tricky dilemma, and you want to be creative without ending up like Daisy Waugh – Panda, Zeberdee and Bashe might be “different”, but it’s a fine line. Finally, scrolling down to the very bottom of the list to the names given to only three girls nationally (names given only twice or less are redacted) throws up the truly awful. Porsche? Lilo? Topsy? There must be some corkers with only one entry. In my last post I talked about how London is getting a new clutch of 200m plus buildings. But then I thought – where are the biggest buildings around the world now? In the past, New York was always regarded as the tall-building capital of the world, and held that reputation even though the Willis (formerly Sears) Tower in Chicago was the tallest building in the US. Hong Kong has always been a tall city, given the pressure on land space. And after that, a few smatterings of tall buildings in Asia held the world’s tallest title – the Petronas Towers in Kuala Lumpur, followed by Taipei 101. Then came The Burj in Dubai – significanty bigger than anything else by some distance, at over 800m (Taipei 101 is around 500m). And yet – the country that leads the way is China. A list of the top 100 tallest buildings in the world (completed, not in construction) shows that China has 32 – just shy of a third. Next is the US with 28. The UAE has 17. That leaves the rest of the world with only 22. And the Chinese surge is amazing – 23 of China’s 32 were completed since 2000. As for New York, of its seven buildings in the list, four were built in the 1930s. That’s a bygone if golden age. Overall, 55 of the top 100 were built this side of 2000. And where are the next clutch of buildings being built? India, Saudi Arabia, and of course, China. Three of the top five buildings under construction are in China, and it has five buildings under construction that will top out at over 500m. Every so often China takes over something as the world’s most or biggest: most internet users, overtaking Japan as the second biggest economy (read Gavyn Davies for the best analysis of the economy issue). In skyscrapers, China may not have the tallest, or even the most iconic, but in sheer volume it leads the way. The young centenarians – but is there still a limit on longevity? Never has 100 years old looked so good. 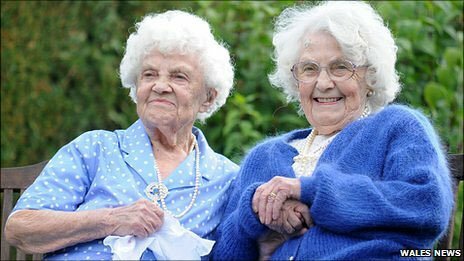 The two ladies (left) from Wales who are the world’s oldest living twins hardly look their age – certainly my grandmothers were in similar nick in their 80s. For comparison, below is a picture of my great (great) aunt Nell, at 103, holding me, age 9 weeks old, in 1975. Nell looks extraordinarily old, which is fair enough, but the two Welsh twins look a good 20 years younger. So, if we are looking so much younger at 100, why aren’t we setting records? Why aren’t we seeing people live to 150? Our life expectancy rises inexorably. What’s going on past 100? Here’s a list of living so-called “supercentenarians”, and the remarkable thing is that no-one on the list is over 115. Why? There’s no-one close to the oldest people ever, who were Jeanne Calment and Shigechiyo Izumi (disputed) who lived to over 120. Scientists have been saying for a long time that medical advances could mean people living to 150. But it’s not going to happen for at least another 35 years, given the current crop. What’s gone wrong? There are two possibilities, which is that either the diet and lifestyle of people born in around 1890 still isn’t a good enough basis for 150 years of life, or frankly, we just aren’t programmed to live that long. Are we even emotionally capable of living through that much history? Whatever the reason, the ultimate outlier, the age of the oldest person alive, went up in the 80s and 90s, but is coming back to where it was in the 1950s. So much for progress. UPDATE: The economist also looks at the rising number of centenarians in their chart blog, but fail to mention the paradox. As the X-factor’s dominance of the TV (and therefore our lives) continues unabated, plenty is being written about the contestants, and the cult-like figure of Simon Cowell. The Observer portrayed him as a bond villain on their magazine cover, but the really interesting picture was the Sgt Pepper style montage inside. Here is a section of it. How many people do you actually recognise? This, in a nutshell, is the X-factor’s problem and why it will face a key dilemma very soon. The X-factor has an in-built problem of supply and demand. Not the show itself – it is pure entertainment, coupled with bitchy drama. The demand from viewers for the show is clearly there. It is what the show is supposed to produce, which is a bona-fide popstar for us all to know and recognise. X-factor is asking us to care about a new person each year. Steve Brookstein, Shayne Ward, Leon Jackson, Joe McElderry: all winners of the UK X-factor, all going nowhere. Leona Lewis is doing well. The jury is still out on Alexandra Burke. And then there’s all the rest. We don’t have the capacity. We don’t buy the CDs or download enough. We don’t have the emotional room to care about every winner. And it’s not just the winners – JLS and Olly Murs are both now welcomed back to the show as “stars”. They came second. We are also supposed to care about winners of Britain’s got Talent – which produces singers too. Even people booted out before the final are reeled out as stars. Stacey Solomon is now in the jungle, being a “celebrity”. Pop stars don’t disappear as fast as they used to. In the past they died young, or faded away. Now everyone looks at the Rolling Stones and thinks – why not us? U2 released their first albums in the 1970s – that’s over 30 years ago now. Plus there’s all the comeback tours – the Police, Madness, Take That. It never ends. We used to need new popstars. There was a replacement rate, much as in a normal population. But like in many developed economies, life-expectancy has increased. A pop career is longer, a pop star is healthier. They will die, artistically and creatively, a lot later. The demographics are no longer stacked in favour of the young – older people are staying with their music, young people have less spending power. If the programme makers don’t acknowledge the problem, people will get fed up with being told “X is a star” when they clearly aren’t. They have two options: admit that the “prize” is less of a guarantee of stardom, and effectively have a devaluation of the currency, or reduce the supply, and only have a show every two years. The two-year option isn’t going to fly, as the show makes too much money. But devaluation of the prize undermines the process. It was once said that pop will eat itself. In this case, it’s more the supply will outstrip demand, and the bubble will burst.